Discussion in 'Frontpage news' started by Hilbert Hagedoorn, Mar 23, 2018. Zooke, Silva, StewieTech and 1 other person like this. Thank you for the tip, but I will have to pass. Thank you but you need to link your account with them and share profile information so it is not free - you give up privacy and if that's free for you then O.K. - Thank you very very much!!!!! Guru3D is a reference in the on-line PC universe, so, keep up with the good work!! Hilbert Hagedoorn and StewieTech like this. Thank you for the tip, please post more of these! Do i want it for free? YES!!!! Redemption80 and StewieTech like this. Hey are you a Portuguese fellaw? Thank you Hilbert. This is a good way to start the weekend. Saw this on Slickdeals and did it, thanks. (Chances of playing it anytime soon, slim to none. ) I just like free games. last f1 game i burned my life for countless hours was f1 2000 on playstation 1 !!!!! i am actually eager to play this ... i was just not eager to pay 30 euros for it or so ! good one! Thanks Hilbert, I tried out F15 and had controller support issues ! Removed 360 controller booted game up plugged back in, set up custom control = sorted. 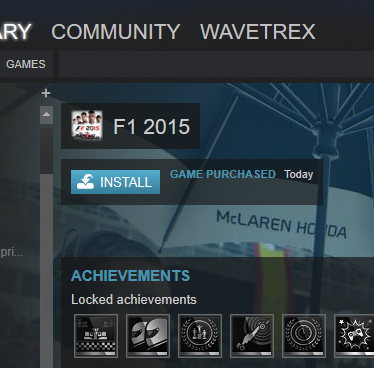 But now downloading F17 to try out for free on steam to see if thats worth the cost. Thanks boss. I wouldn't mind having a modern Racing game since I have played any racing games of this type or similar to NASCAR or F1 since the mid 1990s into the early 2000s.